Waterwasps are a form of Hiveguards that have been enchanted with elemental water. Not only are Waterwasp a great threat in the air, they also can rocket through the water depths like a sharpened submarine. 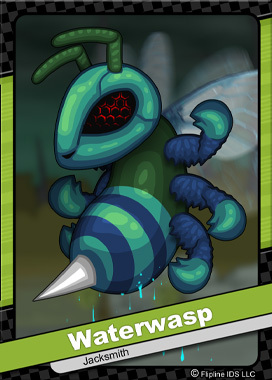 Other Hiveguard varieties include Firejacket, Freezerbee, Buzzstone, Swirlfly, Zapwing, Thornet, Stingshade. All of these dangerous Hiveguards are under the complete control of the great wizard, Dudley.